When I make posts on Facebook, I try my best to summarize sometimes complex issues into a few paragraphs that everyone can understand. The organization called “US Uncut” posted the graphic above on facebook. They are doing the same thing, but doing so in a way that is spreading false information, which ironically is hurting the very people they are trying to help. Let us explore who is ignorant here. 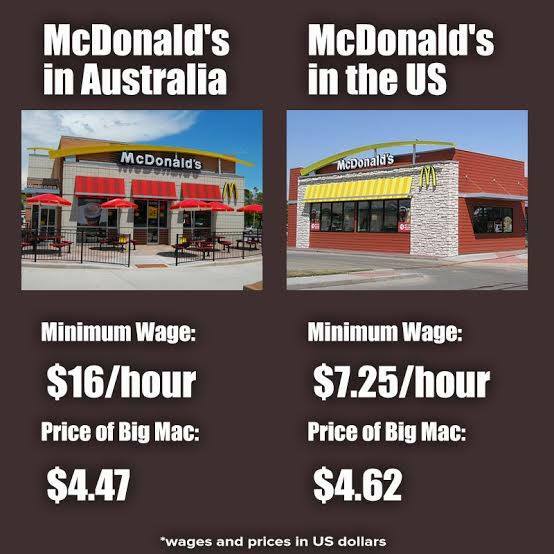 There is a little problem when you compare minimum wage laws in different countries. The countries you are comparing have different tax laws, business structures, natural resources, locations, regulations, levels of corruption, monetary policies, military sizes, subsidies, and more. And the most important piece that is probably vastly different? PRICES. Why is minimum wage $16/hour in Australia? Because everything costs more. A LOT more. In fact, Australia is one of the most expensive countries in the world. Local Purchasing Power in Australia is 14.63% lower than in United States and Australian’s average monthly disposable income after taxes is only 12.46% more than the U.S. Do you realize how bad that is? This is with everything being 30% more expensive! And it gets worse…the Australian Big Mac is 20% smaller than the U.S. Big Mac. Its so easy just to blame “capitalism” and the ruthless, profit driven companies, who take advantage of the poor workers. When you create perpetrators, you also create a bunch of victims. Are we going to use the paradigm that we are all helpless victims at the whims of these evil empires? It is true that we are not all born with the same resources or incomes, some start at the bottom and work their way up, while others are born at the top. We all make choices in our lives, no one forces us to work anywhere and if that choice is no longer serving us, we can make another choice to acquire more skills to get paid more. Organizations like “US Uncut” are doing nothing more than perpetuating a victim mentality, spreading the lie that the government is the great equalizer. The facts are this: when you raise the minimum wage, you increase the cost for low skilled labor. When you increase the cost for low skilled labor, you decrease the demand for low skilled labor. This is not my opinion, it is basic economics – when costs rise, demand falls. People think this helps the poor, but in fact, it takes away jobs from the people who need them the most. By raising the minimum wage, you take away peoples ability to learn on the job and develop the greater skills necessary to earn higher incomes in the future. Most people who earn minimum wage are young, unskilled workers. How are they doing in Australia? Australia’s unemployment rate for workers age 15 to 19 is currently 12.3%. The people who vote for this are not bad people – they are just uniformed. But in fairness, they recognize that prices continue to rise much faster than wages and want a solution. But the problem is not that companies do not pay enough – it is the rising prices that is destroying our purchasing power. When a dollar earned buys less and less every year, the solution is not to mandate more of those worthless dollars to be paid out! The solution lies in eliminating the institution who is destroying the purchasing power of those dollars, which will make $9 or $10 an hour actually mean something. Voters need to learn more about the destructive policies of the federal Reserve. When you print money (counterfeit), and lower interest rates (price fix), it causes people to borrow and spend money at the worst possible time (they did all of this because the economy was in the toilet). 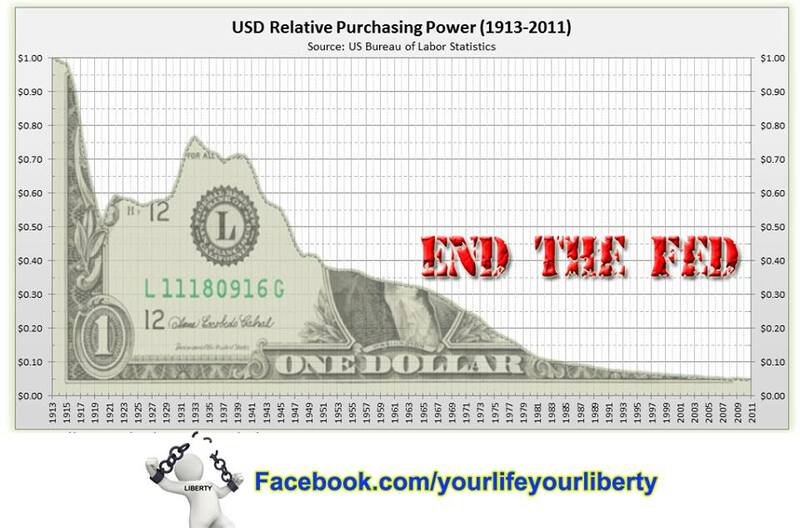 When they add to the money supply and create a phony recovery based on nothing, it causes prices to rise. Prices have been and are currently rising between 4-7% per year, every year. Yes, I know you probably heard that it was only 1%, but the official C.P.I. numbers do not count food and energy, which helps the government fool most people that inflation is low and isnt a problem. Peoples wages stay relatively the same, so every year they are being robbed of their purchasing power as things become more and more expensive. When your money loses value every year, things become alot more expensive over time. An item purchased for $1 in 1913, would cost $23.85 today. Then they have many believing the solution to this destruction of our money is to simply continue to raise the minimum wage, instead of stopping the destruction! They can’t raise taxes because no one will vote for that party again, but this of course, IS a tax. It’s the worst kind because it is SILENT. These policies hurt everyone, but especially the poor and they discourage any kind of savings, as it’s better to spend your money today, then save it. It actually punishes the savers. So they tell us we must consume more and more to produce a healthy economy, which is an outright lie. Savings and REAL production grow an economy, not credit creation by a banking cartel. These policies punish the people, but benefit both the government and the banks. The government doesn’t have to be responsible with their spending, they can always just print more. They also reduce their enormous debts through this process of inflating it away. The banks who are part of the federal reserve, get paid interest on all the money they print. And the other banks who are not part of this criminal institution, also benefit as they get access to the money first, before it has lost most of its value from rising prices. We need to put an end to Keynesian economics and the destructive policies of the fed. No matter what anyone says, it is totally immoral to use the strong arm of government to force a business to pay its workers more. I dont care if you “voted” for the initiation of force or not. Laws were not made to force people to do things – precisely the opposite – laws were made to PREVENT the use of coercion or force. There is another way – for more, please ‘like’ my liberty page. Please also share this article to inform others that government intervention and force is not the solution to all of our problems.